A Measure of Self Defense. You are hereby authorized to provide for the organization of four regiments of the loyal citizens, residents on both sides of the Potomac river, from the Monocacy to the west boundary of Maryland for the protection of the Canal and property and persons of loyal citizens of the neighborhood, and to be stationed in the vicinity, whilst in the service, The men will be permitted to elect their own company officers; their field officers appointed by the President. Arms will be furnished as soon as practicable. It will be perceived from this letter that the Federal Government proposes to confine the services of the Regiments to the region of country in which they are raised. 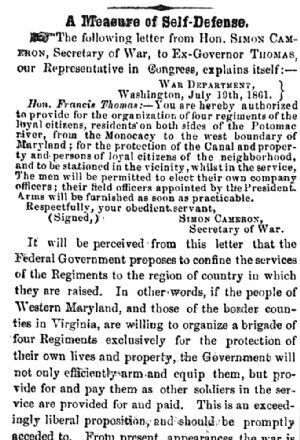 In other words, if the people of Western Maryland, and those of the border counties in Virginia, are willing to organize a brigade of four Regiments exclusively for the protection of their own lives and property, the Government will not only efficiently arm and equip them, but provide for and pay them as other soldiers in the service are provided for and paid. This is an exceedingly liberal proposition, and should be promptly acceded to. From present appearances the war is likely to be a protracted one, and during its continuance we have no security whatever for either life or property, save such as courageous hearts, and strong arms and dry powder afford. We have not only Secessionists in our midst, who would kindle the fire and fan the flames of civil war the moment they thought they could do so successfully but from our peculiar geographical position, we are constantly exposed, in our persons and our property, to invasions and depredations from the infuriated rebels that are swarming along our Southern borders. The three counties of Frederick, Washington and Allegany, constituting what is understood to be Western Maryland proper, could alone furnish the number of men required to organize the Regiments, and we can see no substantial reason why they should not immediately take the necessary steps to do it. The Virginia counties on the border will, however, supply a small portion of the levies, but whether they do or not, there is an abundance of material in the Maryland counties for the purpose, and it should be promptly wrought into proper shape. Let us then by all means have this Home Brigade under lawful authority, and we shall feel perfectly secure from marauders of every kind. It may be proper to add to the above that any information desired by those who may wish to join the Regiments can be had on application by letter addressed to Governor THOMAS at Frederick, where, in his absence, such letters will be answered by an officer in the army who is stationed there for the purpose.